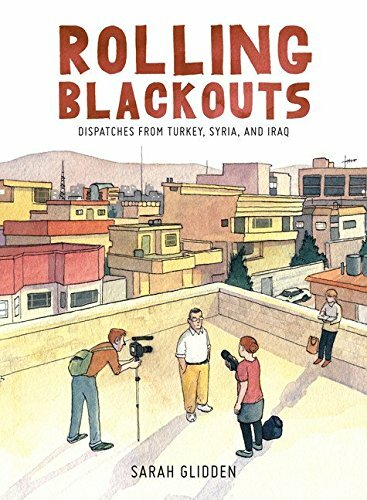 I heard about Sarah Glidden's Rolling Blackouts: Displatches from Turkey, Syria, and Iraq on NPR's Book Concierge. Glidden traveled to the Middle East with some friends who work as independent journalists. They spent several weeks talking to displaced Iraqis and other individuals and trying to think of ways to pitch stories to news organizations back home. They work on two main stories - one about Dan, an Iraqi veteran who is returning to the region for the first time and wants to talk to Iraqis who lived through the war, and one about Sam, an Iraqi refugee who found his way to Seattle with his family, somehow ended up in the 9/11 Commission report, and was deported back to Iraq. Much of Glidden's story, though, focuses on her journalist friends, and the work they do. It's no secret that news organizations have significantly reduced their foreign staff, and that reporting has suffered as a result. There are very few reporters abroad with long-term contacts, and so they cannot report on longer-term, slower burn stories. We understand the world less because of it. Governments are more corrupt because of it. Reporters are less safe because of it. We are all less accountable to each other, from individuals to governments to multi-national corporations, because of it. Glidden's book highlights some of this loss to us. She shows us an Iraq that suffered through war but still has culture, friendship, delicious food, and beauty. Some Iraqis are happy that Americans came, mostly because they suffered deeply under Saddam Hussein. Others hate Americans for ruining their way of life. I really enjoyed the way Glidden's friends shared stories of Iraqis in multiple countries to provide a broader perspective. I also liked the way Glidden used light, bright colors in her art to humanize the experience of so many people whose lives have been upended so completely. Not only the Iraqi refugees themselves, but the lives of the Turks and Syrians as well. I was less enamored with the story around Dan, the Iraqi war veteran. I feel like his return to Iraq and his opacity in sharing his feelings and whether his feelings about the war and his participation in it took up an outsize amount of the story. In a way, it felt very "Yes, of course, focus on the white guy's story because that would be the most compelling to everyone." I don't think that is fair to Glidden's reporter friends, but it seemed like Glidden wanted to focus the most on that story. She even ends that story arc quite dramatically, with something like, "Sarah never interviewed Dan again" as the only words on a whole page. Which makes it sound like either Sarah or Dan died, but neither of them did, and they continued to stay friends and talk to each other, she just didn't interview him again about the war. I was thinking as I was reading this that it sounded like my kind of thing, and I see that you agree! I'll see if I can get it from the library in time for the Readathon this weekend. Hooray! I look forward to seeing what you think. It's definitely not a perfect book, but a lot of the points she makes really hit home, especially as we feel more and more isolated from the rest of the world. This sounds good and I haven't heard of it before so it's going on my TBR list. Thank you! Gah, I'm sad because I tried to read this and I got fed up with Dan and the small font and gave up. I AM SORRY TO ALL OF PUBLIC RADIO AND ALSO THE WHOLE OF THE MIDDLE EAST. Oh, I completely understand getting fed up with Dan. But I was also fed up with all the focus on Dan instead of on literally EVERYTHING ELSE that was more important. This is on my list (she appeared at this year's International Festival of Literary Authors locally) with the other authors you've mentioned as a potential binge-reading project. But, of course, it's the usual challenge: how to read everything that appeals along with everything that educates (not always the same thing, but fortunately there is some overlap)!